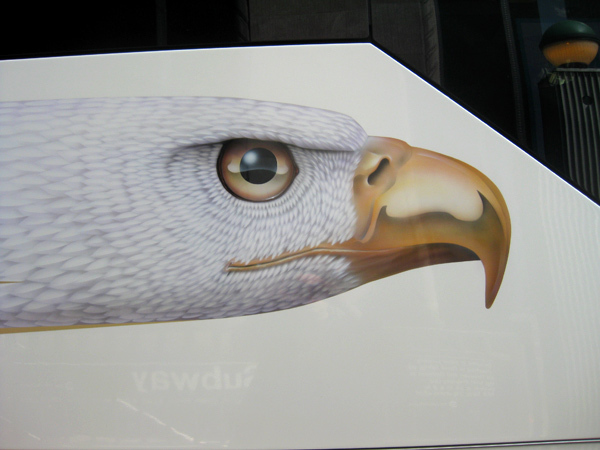 Two good bits of design to share with you: one is a bus I walked past the other day with possibly the best airbrushing I have ever seen on the side. 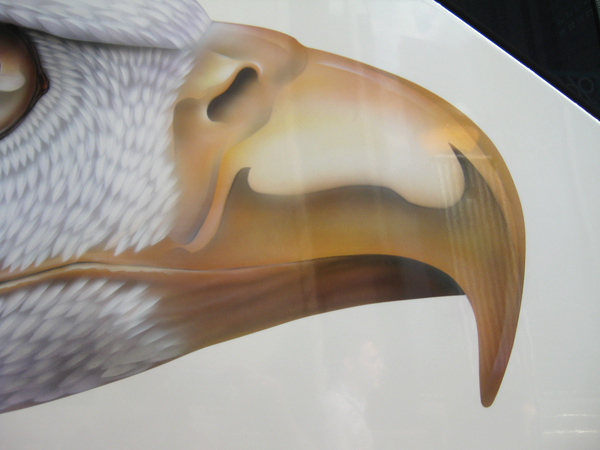 The feathers aren’t just white and gray, there are nuances of pink and blue in there. It’s just stellar. I would let whoever did this paint anything they wanted on my van with shag carpeting anytime. Continuing with the exterior art theme, I saw a video for some guys who painted a wall. What I liked so much was how they handled the shadowing, in repeating adjacent stripes. It’s a really lovely technique I have seen before. Spam, wallpaper, and the Great Beetle Failure of ’10. 1. I received a the best piece of spam ever today. I made me ever so happy. I am a tickety-boo site. Don’t you wish you were a tickety-boo site? I bet you do. 2. I was watching Eminem’s new video which is supposed to be taking place in a crappy wood-paneled double-wide, and in one scene Megan Fox is getting beaten up by Dominic Monaghan and he puts his fist through the drywall in their living room and – hey, what’s up with that wallpaper? I remember that wallpaper. I saw it on a design blog somewhere and I thought it was gorgeous and then I saw the price, which was $250 a roll and I was like, oooh, a little too rich for my blood. And now I’m supposed to believe a crappity trailer has that wallpaper in it? I think not. I could no longer suspend my disbelief. Bad set decorator. Baaaaaaad set decorator. 3. A while back I decided to incorporate different materials in my art, like eggshells and insect exoskeletons and tin cans, stuff like that. 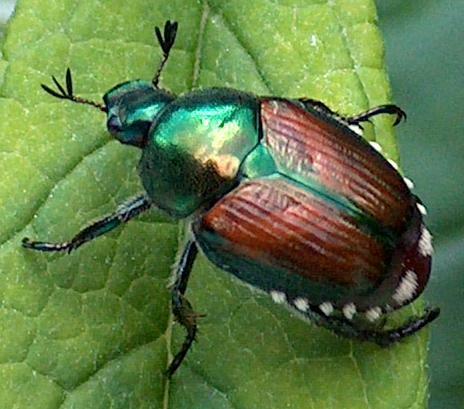 So recently I thought, hey, there are Japanese beetles everywhere, they’re not indigenous, they’re a scourge, I should collect their deceased bodies, remove their wing casings, and use it in my art. 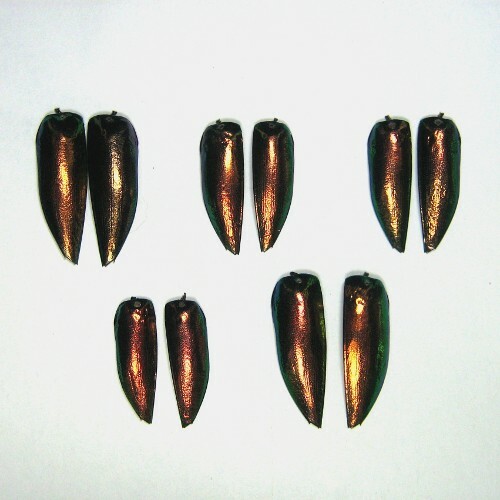 Here is a photo so you can appreciate their bronze-colored elytra. 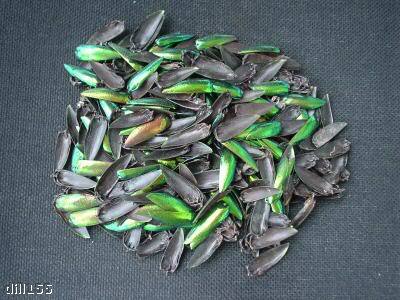 And a pile of 200 random non-matching elytra. 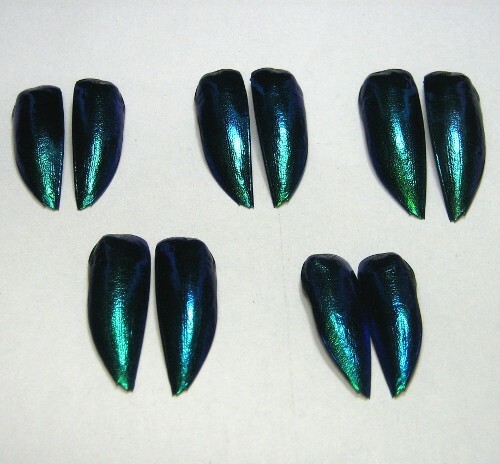 They should be here next week. We’ll see if I can get them to do what I need them to do. 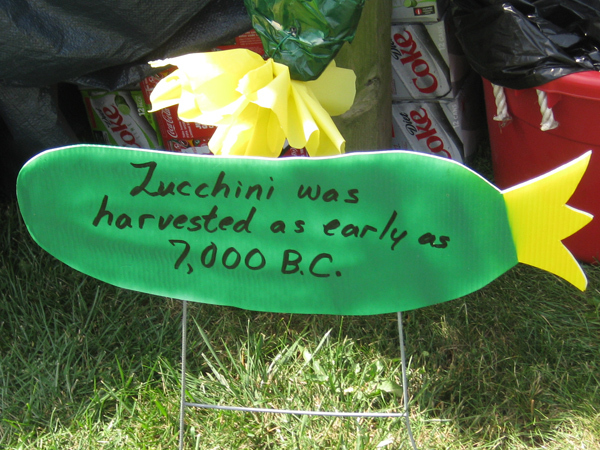 I went to Massachusetts to The Zucchini Festival. A festival! 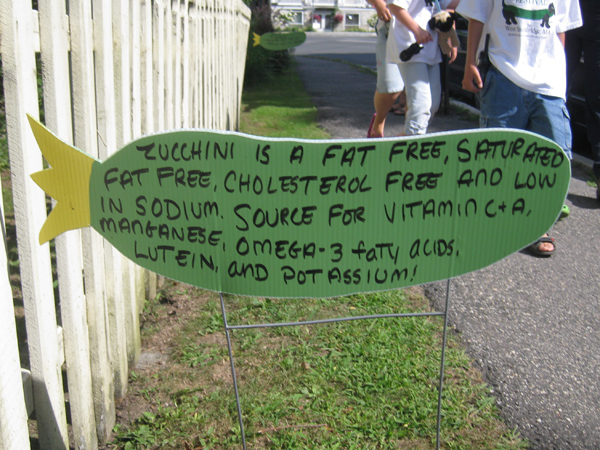 Devoted to zucchinis! Hurray! On route to the gaiety I saw a man shining up his ancient vehicle. 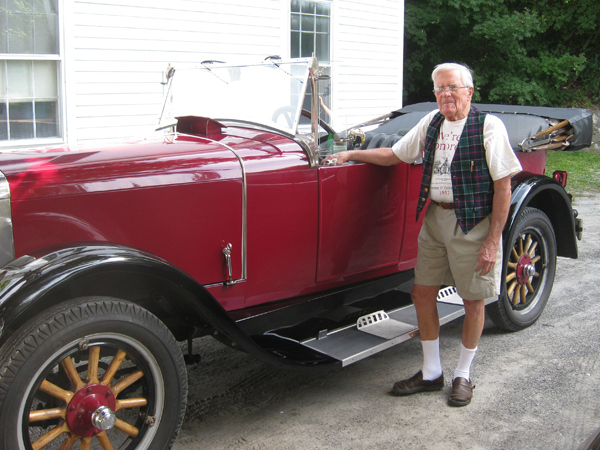 Check out the wooden spokes. 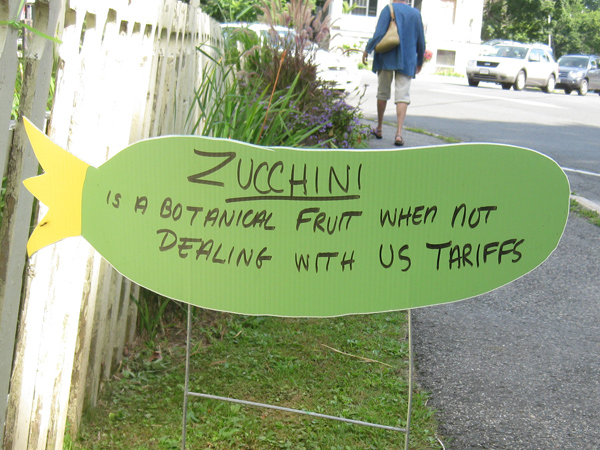 And then lovely, hand-made zucchini signs informed you of all the important things like times and locations. There were also signs peppered all over telling you important facts. 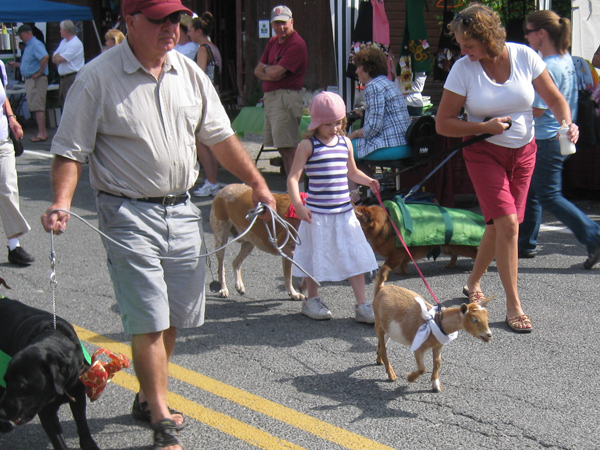 I got up very early because I knew the day began with the Pet Parade. 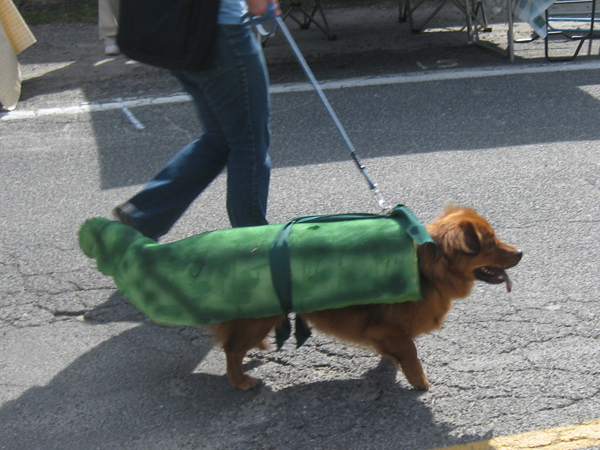 People take their pets and decorate them to look like zucchinis and then parade them down a tiny, short street and prizes are given at the end. I couldn’t miss that. I got to meet some great beasties. 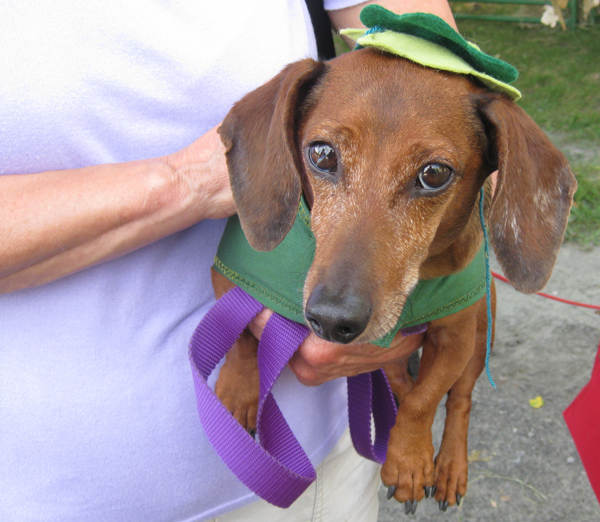 First I met a dachshund who was totally rockin’ the look. It wasn’t hard for him, being all elongated-squash-shaped and all. 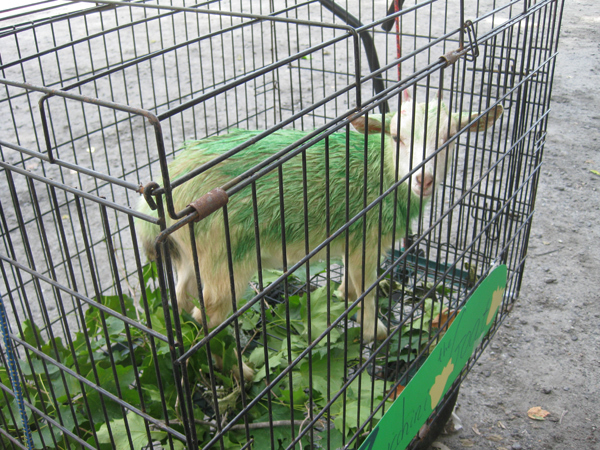 Then there was a goat, painted green, in a cage filled with leaves. 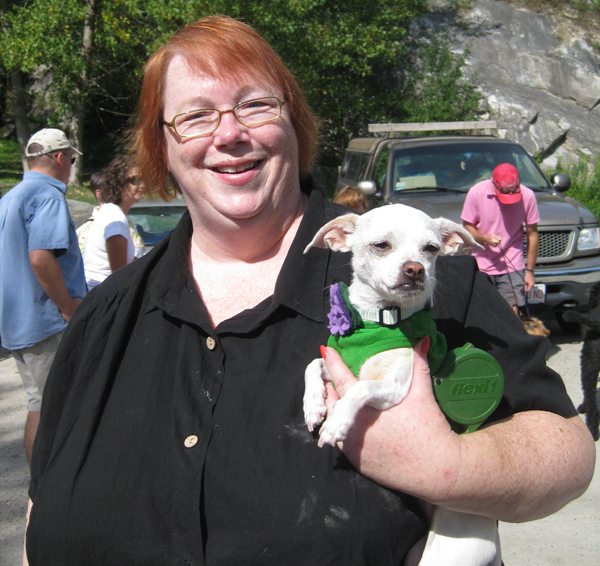 Large woman with tiny chihuahua? Check. 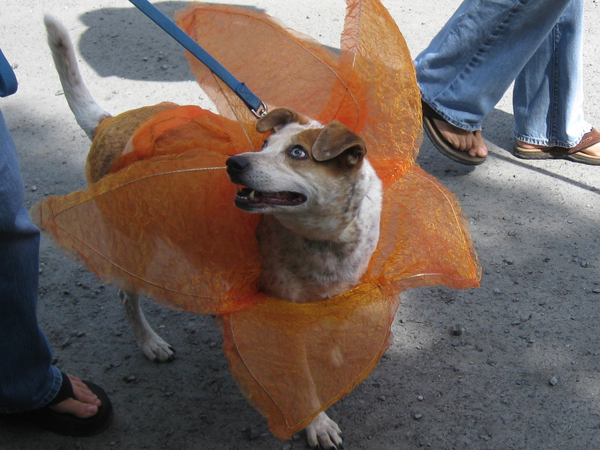 Herding dog with creepy blue eyes dressed as a zucchini flower? Check. 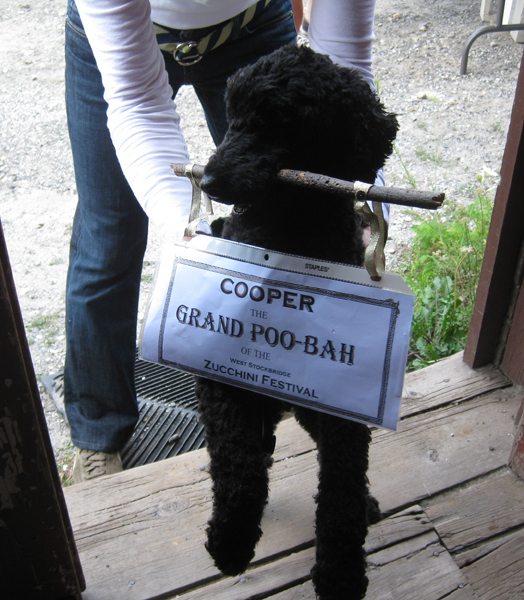 The dog’s name is Ellie, and she was lovely and super-psyched to be wearing a costume. You could almost hear her. “Look at me, I’m a flower! 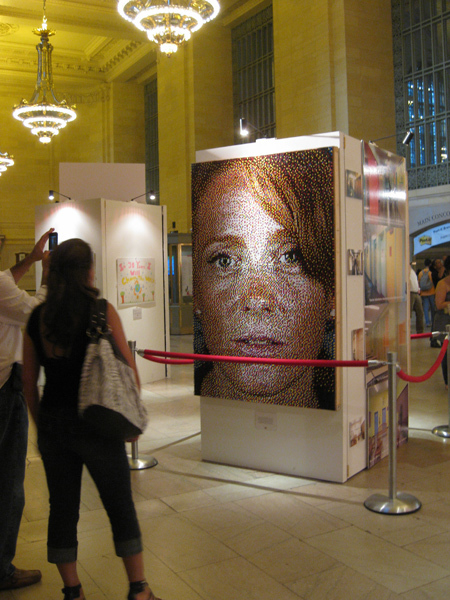 See me? Flower! Oh boy! Flower flower flower!” etc. Cooper, I learned, loves to carry things in his mouth. So he carried his little identification sign around with him all day. 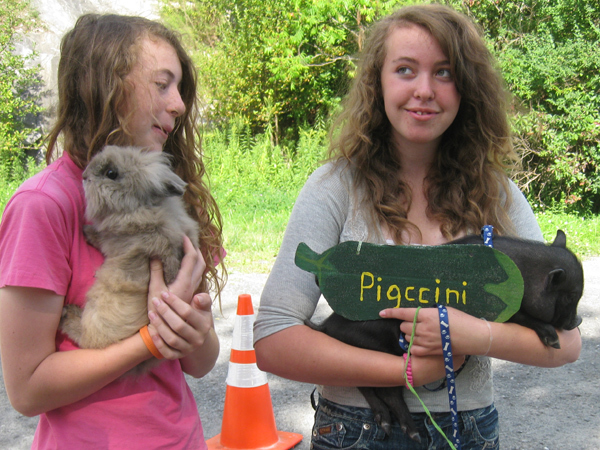 …and two girls who are members of 4-H and brought some delightful companions with them, two of which were Pig-ccini and a lion-head rabbit. 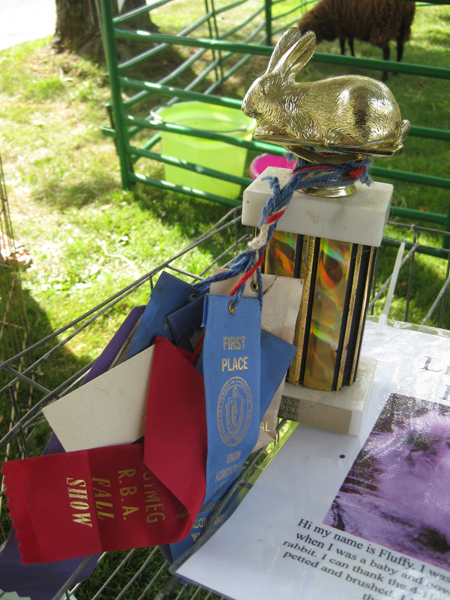 An award-winning lion-head rabbit, I’ll have you know. There was also Stephanie the cat. Poor Stephanie. 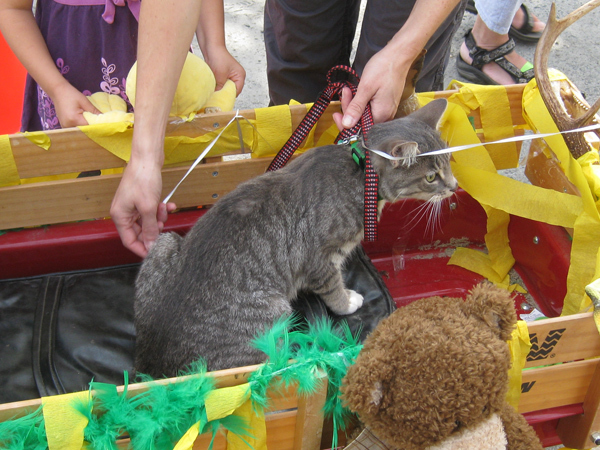 Clearly this was the backstory: a three-year-old boy told his parents that he wanted to be in the pet parade, in a wagon, with his beloved cat by his side. The parents, being high on crack or something, decided this would be a good idea. 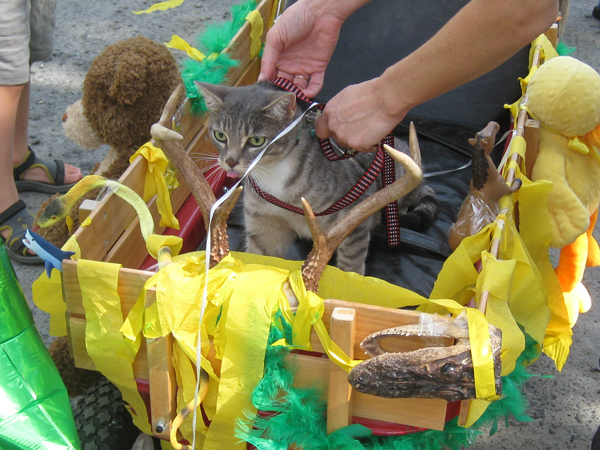 So Stephanie the cat was placed in a wagon adorned with antlers and a dried crocodile skull (you see them on the front there), had a leash put on her, and sat there while this young feller aggressively pet her. She so clearly did not want to be there, AT ALL. You know that night she barfed in each and every one of her owner’s shoes. And rightfully so, I would add. I would do the same thing had I been in her place. Hork away, Stephanie, hork away. 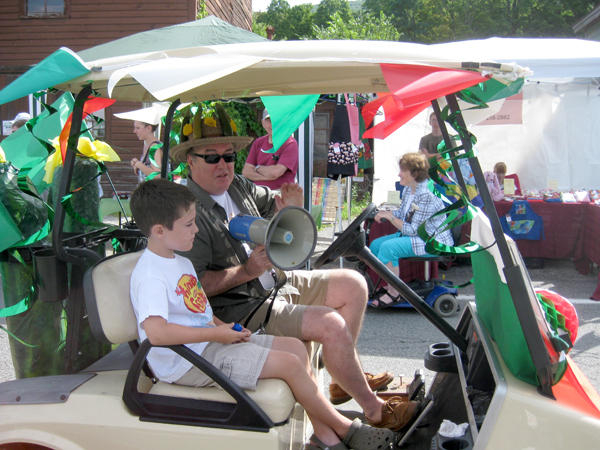 Leading the pet parade was the Master of Ceremonies, with his festive hat and his ornately-decorated golf cart and his bullhorn. 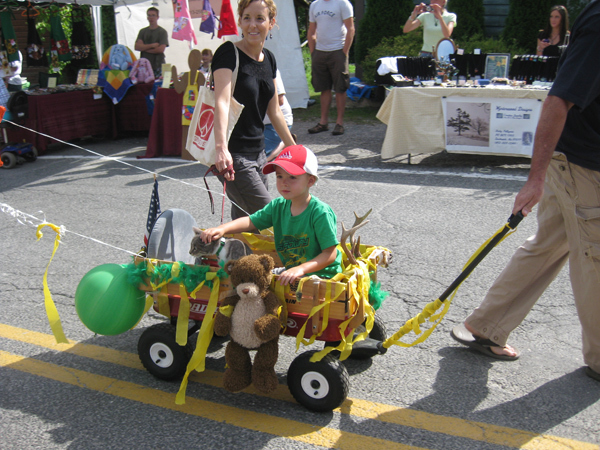 Once the parade was over, the fun was not done. Oh no. 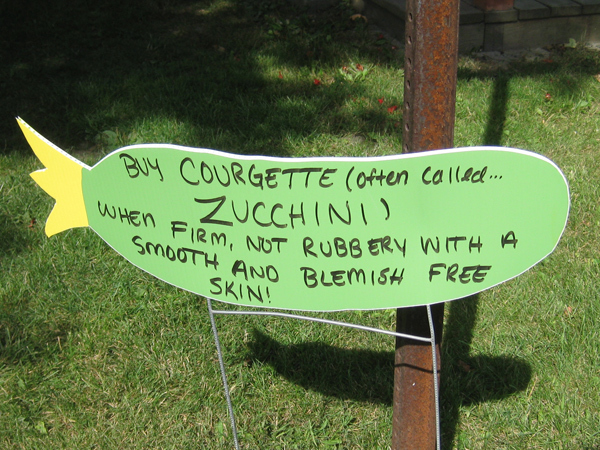 There were all these vendors selling things ( I bought Cricket a t-shirt and I bought myself zucchini relish and zucchini bread). 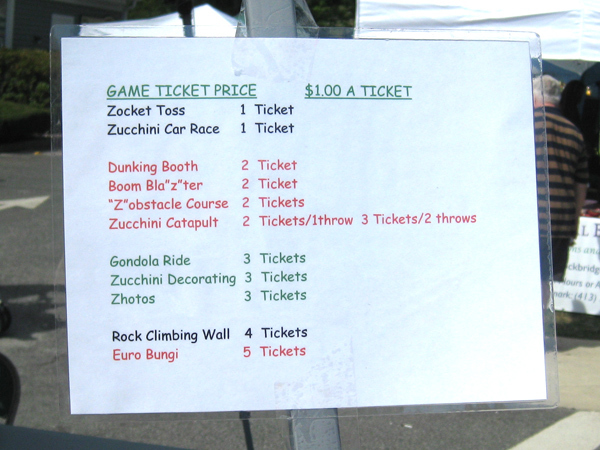 Here’s a list of some of the other fun things they were doing. 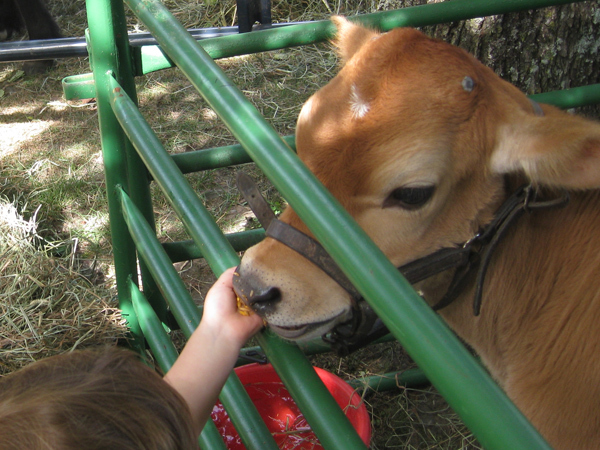 The nice 4-H girls live with their parents on a farm, and aside from bringing the green goat in the cage, the pig and the rabbit, they set up a petting zoo with heirloom chickens, two geese, a flock of the sweetest sheep from Turkey, two ponies and my cow. 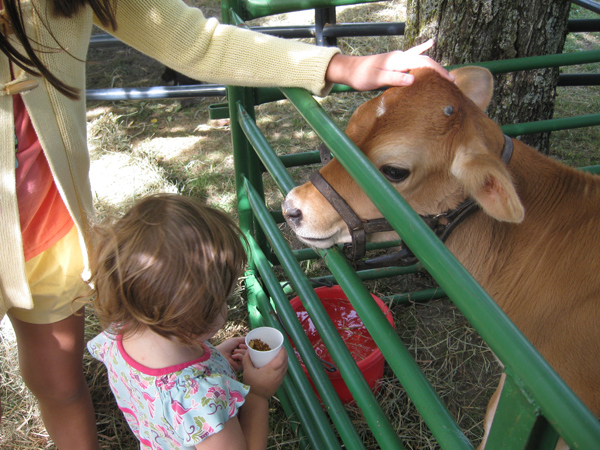 I clearly called it “my” cow because I love this cow. Really. 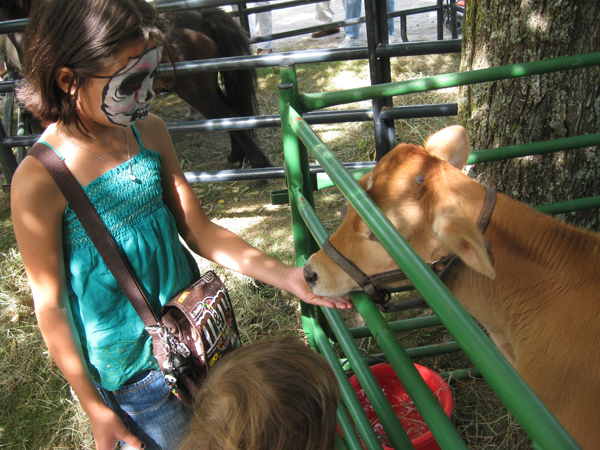 My favorite picture of the day is a girl with a skull painted on her face feeding my beloved cow. I want to live with this cow. 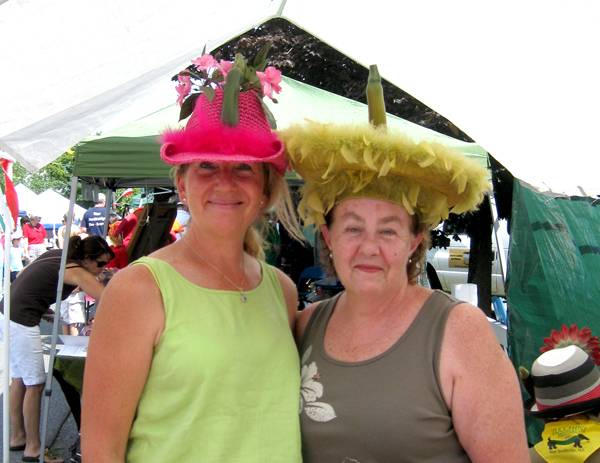 By the way, the MC was not the only person wearing a zucchini-themed hat. Ooooh no. 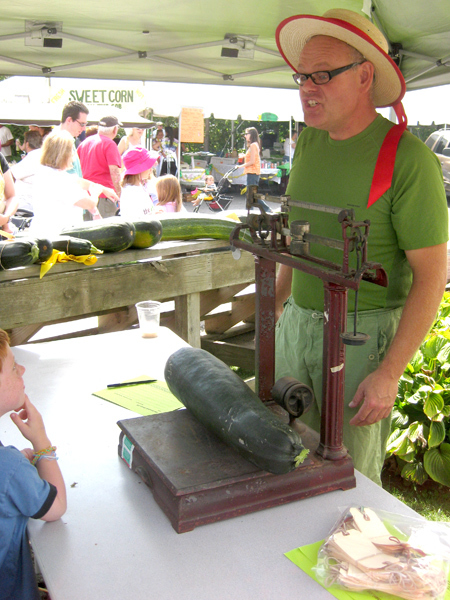 People were bringing their gigantic monster-zucchinis to be weighed and entered into a competition, and this guy, who reminded me of Alton Brown, was in charge of the weighing area. 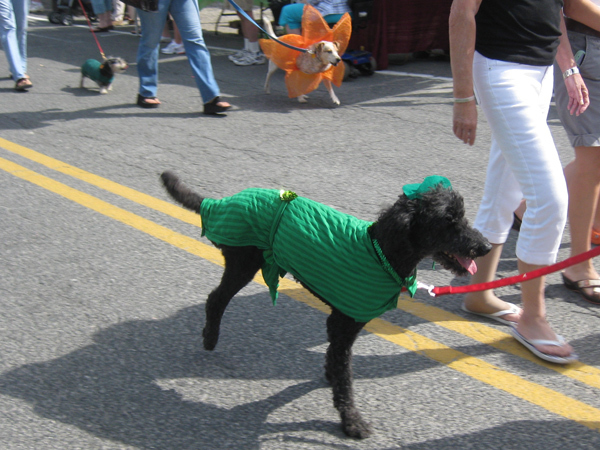 I walked, I ate, I talked to people, I talked to their dogs, the whole thing was wonderful. I don’t know what my schedule holds for next year, but if I’m free, I’m going again. It’s a hoot. More accomplishing! And then some Post-Its. 1. 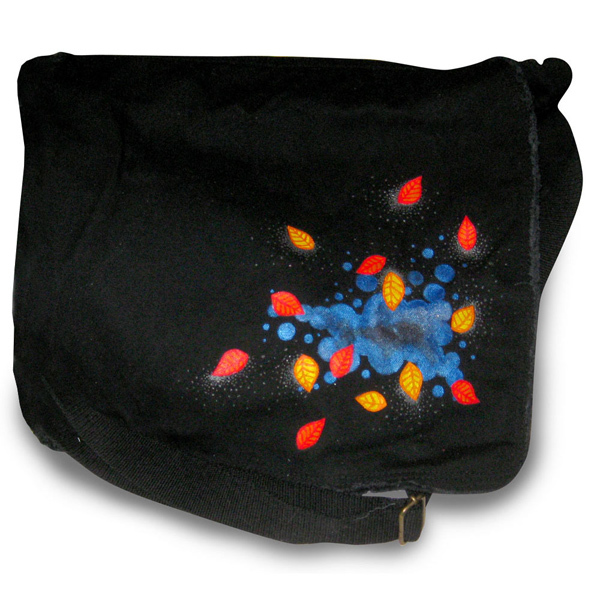 I got a request to do a special-order bag for a lovely woman in Belgium – she liked the design I had on a pre-existing bag of mine, but she wanted a bigger version for her laptop – so I made it and shipped it off. I feel so very fancy and important mailing my stuff off to Belgium. 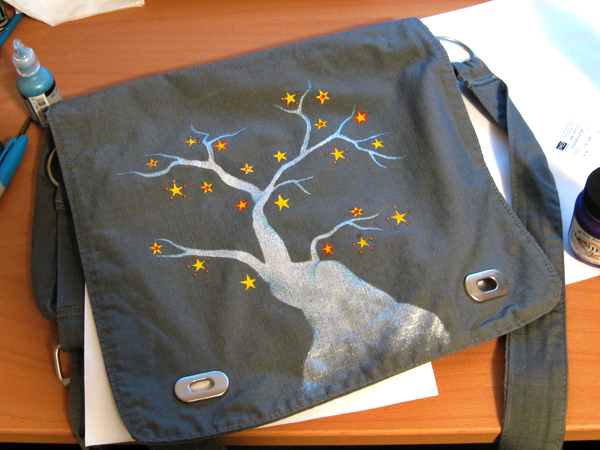 Here’s the bag I painted. 2. Various companies rent out Vanderbilt Hall in Grand Central to hawk their wares in a big way, and this past week it was the an office supply company, focusing predominantly on Post-Its. 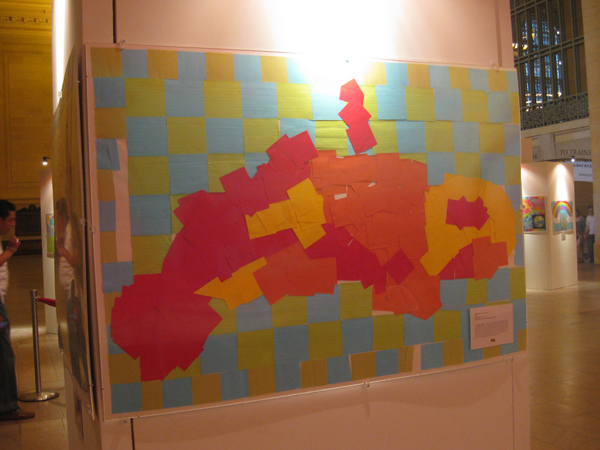 They had a bunch of schoolkids make collages using Post-Its, and they were fine. About what you’d expect. 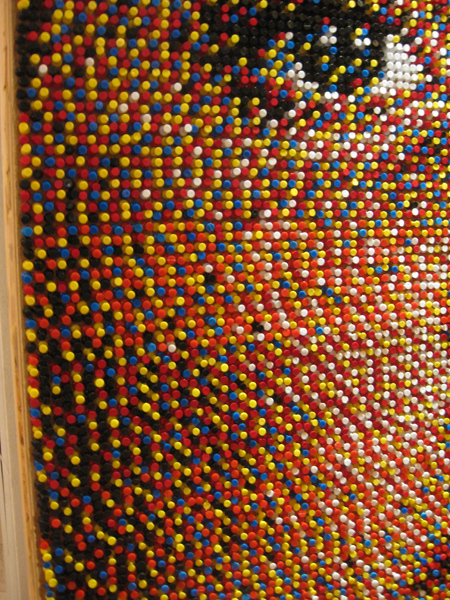 But then off to the side were these Chuck Close-style portraits, you know, cropped really tight on the face, not necessarily flattering, made up of many, many small things. You want to know what it’s made of? Pushpins. 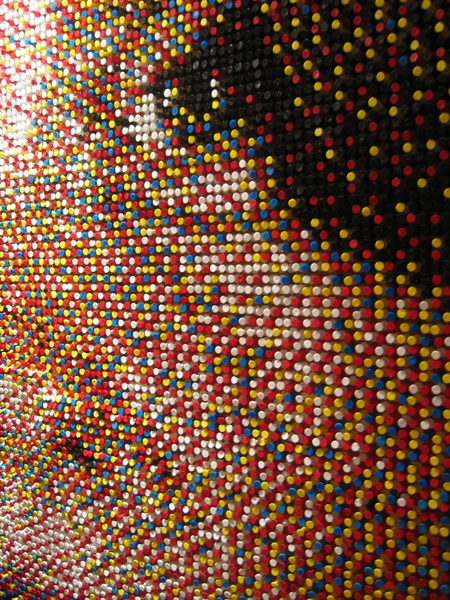 Red, blue, yellow, black and white ones. Pretty amazing, huh? Here’s the other face on display. 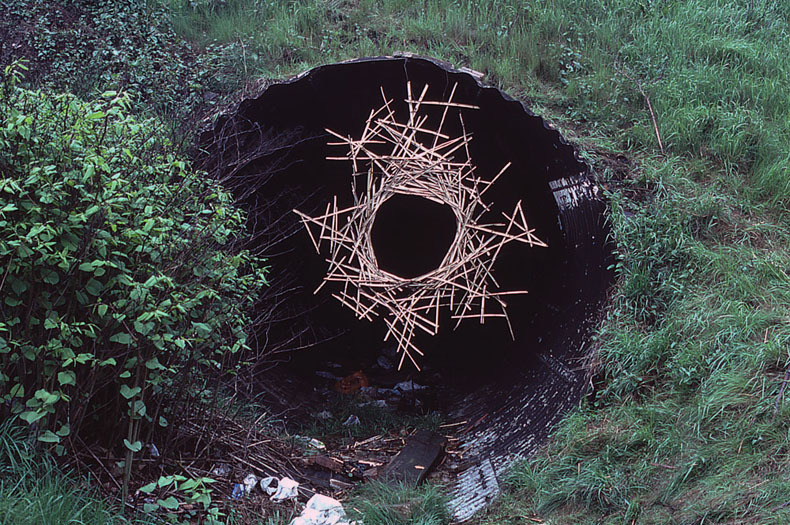 I LOVE this kind of thing, where someone takes ordinary mundane objects, and through an insane amount of hard work creates something really beautiful. 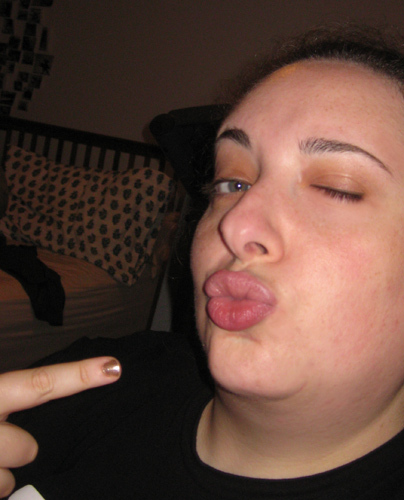 Addendum: This is a photo of my “fancy and important” face. You have to imagine me making that face while nodding my head slowly up and down and making a “mmm-hmmm” sound in a pompous way. Spectacular, isn’t it? Awww yeah. I am accomplishing things, and it feels goooood. Today, I cleaned up the apartment which had become a wee bit slovenly. I then finished up some art projects and I figured I would share one with you. 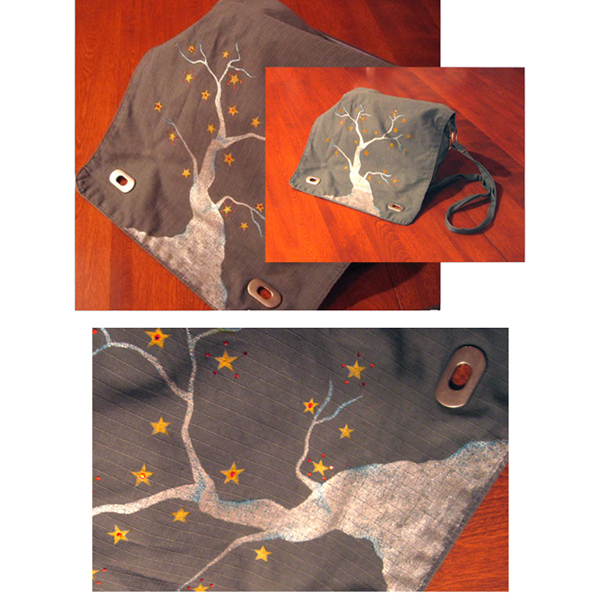 This is a purse I painted for a client about a year ago, and it was supposed to be a surprise gift, so I didn’t post any pictures of it, in case the client read my blog. But a year has gone by, so I think I’m safe. My review of Black Sheep. A friend of mine recommended that I see Black Sheep – not the one with Chris Farley and David Spade, the other one – which is a movie about genetically modified sheep in New Zealand who develop a taste for human flesh. If it sounds deranged to you, you’re absolutely right. It is batpoop looney tunes. I don’t care for horror films, but I made an exception for Black Sheep because all the puppets and costumes were made by Weta, which is the studio that made all the Lord of the Rings sets and costumes. Here’s the trailer. See? I wasn’t lying. I actually live-blogged it to my friend Börkke, who had seen it recently. I figured rather than reviewing it, I would just copy and paste my comments about it here. I thoroughly ruin the ending, so if you want to see Black Sheep and would like the ending to remain a mystery (and oh, it’s magical, I tell ya), don’t read any further. I’m up to the evil baby sheep that was in the jar biting the sheep on the snoot. And now…oh dear, she’s standing in front of the car. Oh look, little fluffy bunny. A really scared little fluffy bunny. Earless Guy is talking to little fluffy bunny. AHHHHHHHH! Not okay. Dead bunny. EVIL SHEEP IN THE HOUSE!!!! OH NO! SHEEP IN THE YARD!!! Wait, they’re just regular sheep. OH NO!! SHEEP RUNNING OVER THE HILL!!! Also, Farmer Boy’s foot is a hoof. This does not bode well for our cast of characters. Well, I hope you’re happy. The sheep are grazing on human corpses. Aaaaaand there’s an oozy hand wound. Delightful. Everything’s gone to hell. The sheep are killin’ errbody up in here. Entrails are being munched. Limbs are being ripped off. A dude is reading the bible (it isn’t helping). There’s a were-sheep is in the kitchen and he sounds like Chewbacca. This is all so very weird and bad, and even more weird. What the frick is going on? I hate this movie. I now also hate farmers and sheep. This movie is seventy-five types of wrong. Ahaha! He blew up the sheep using their farts! Awww, now he’s a farmer and he’s not neurotic no more. How lovely. Please don’t make me watch this again. I’m watching Life right now, the David Attenborough/Oprah Winfrey-hosted BBC nature series. It’s very similar to Planet Earth, but they focus on different animals this time. 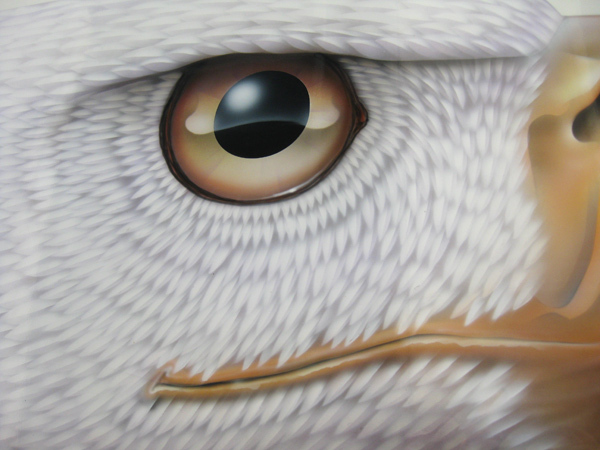 One of those animals is the bowerbird. I would love to describe the bowerbird to you, but I think it’s best you see for yourself. Yeah. My favorite part is when part of his display tries to leave, and he’s like, “You’re ruining my vision! You go here!” Here’s another video of the male bowerbird in action. PILLARS, people. The bird understands ARCHITECTURE. I’m so impressed. 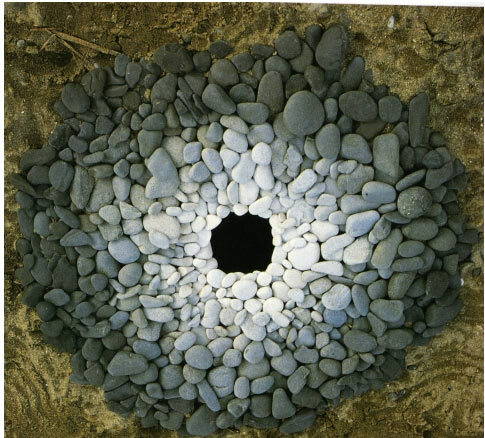 So, anyway, I saw a photo the other day, and I was convinced it was a piece of environmental art by the famous artist Andrew Goldsworthy. Nope. 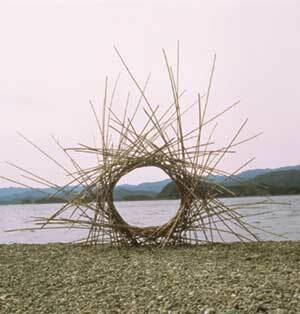 Bowerbird house. 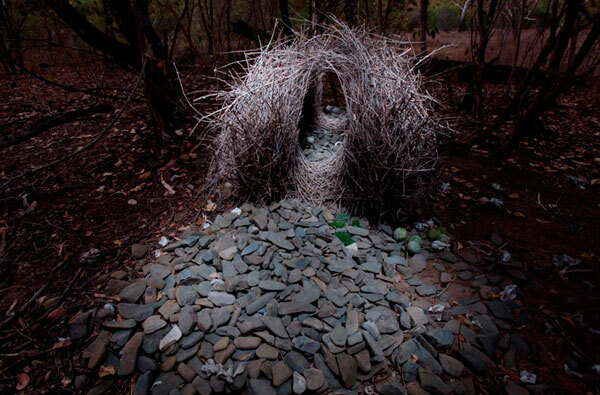 I found some pictures by Andrew Goldsworthy and mixed the bowerbird photo in there, so you can appreciate how freakin’ awesome this bird is. Be humbled, people. Be real humbled. I made some things for work. They so pretty. We have these black books that we bind stuff in, and they’re fine and everything, but they can get boring. 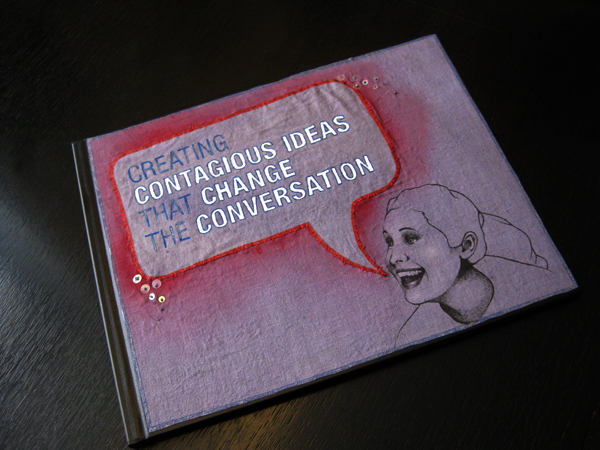 So my boss asked me to look into alternatives we could do with these covers. 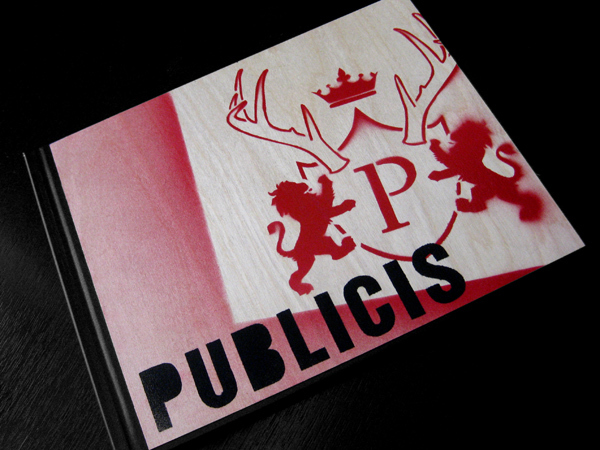 I took that as an opportunity to make all different covers out of all different materials. I am so very crafty, I am. 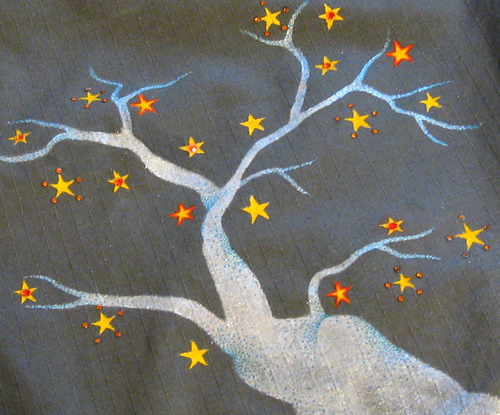 There’s one I made by hammering metal, and one I made by cutting a stencil and spray-painting on wood, and I embroidered and fabric-painted one. 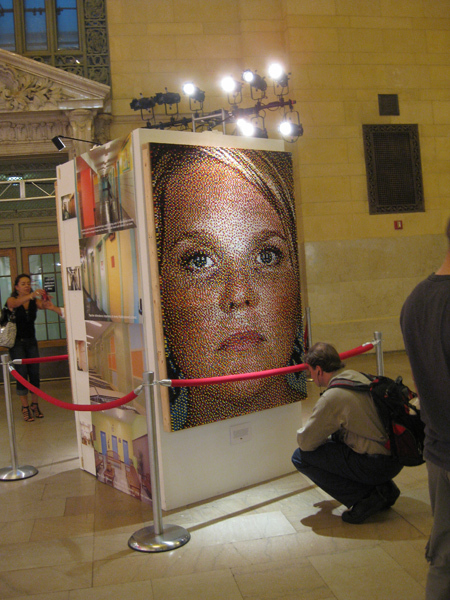 That’s a portrait of my co-worker Börkke on there. 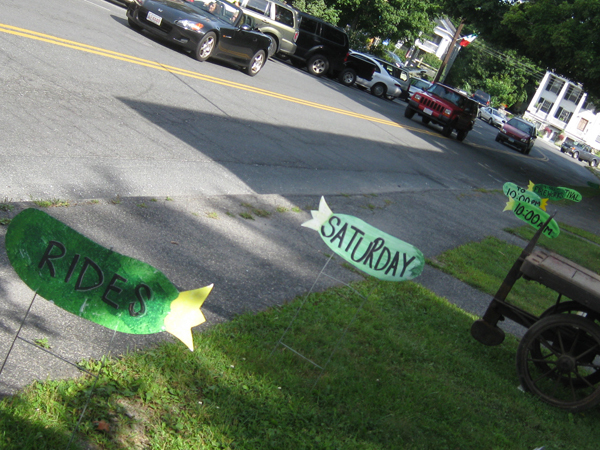 I had a lot of fun making them and my boss was impressed with my ingenuity, so props to me. You can’t see me right now, but I’m patting myself on the back. It looks like I’m having a stroke, but trust me, that’s what I’m doing. You are currently browsing the design-newyork.com blog archives for August, 2010.